Thanks to our donors and volunteers, Thanksgiving on Good Friday was a tremendous success. 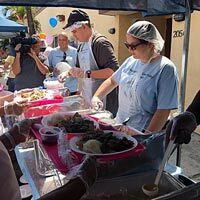 Nearly 2,500 homeless and needy men, women, and children were able to experience a very special time. Following the example of Jesus, volunteers washed the feet of those in attendance. 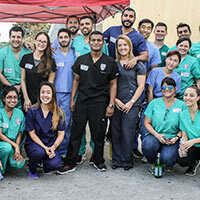 Podiatry students from Barry University provided foot care services. 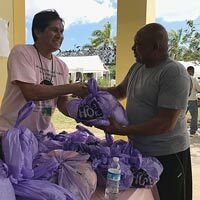 Each person attending also received a purple MISSION HOPE bag filled with hygiene items. 60 men and women came off the streets during the outreach. Super thanks and much appreciation to our entire team that made Thanksgiving on Good Friday such a huge success. Look at all that was accomplished and the thousands of lives that were impacted. People in great need experienced the love of God and of our communities. Your support touched so many lives! Over 600 had their feet washed. 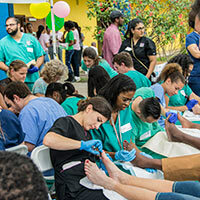 Barry University provided foot care! Had over 500 Fantastic Volunteers serving! Over 350 attended our health fairs! 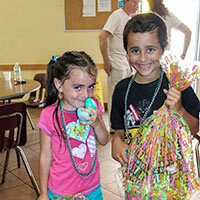 Nearly 500 kids had special activities and were given Easter Baskets! 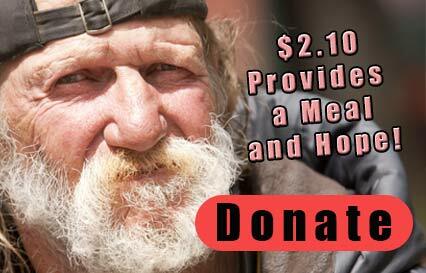 60 homeless men and women decided to enter one of our programs! Gave over 3,000 clothing articles! Over 1,100 Mission Hope Hygiene Bags were given.! There was great food, entertainment, Easter Baskets, haircuts, children’s activities and so much more. A very special thank you to our wonderful volunteers, donors and supporters. At the Miami campus, attendees enjoyed a Good Friday message by Pastor David Stocker Jr. of Brave Church, live musical performances by the Regeneration Singers (Mission Client Singers) and various musical groups. A Resurrection Play performed by the Miami Rescue Mission’s program residents depicting Jesus’ final days and resurrection, moved guests to tears. 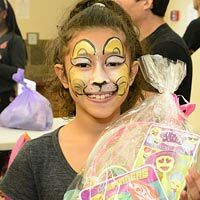 Over 400 children received Easter baskets at the conclusion of the event plus all the children that attend the mission’s after school program and reside at the mission and its centers. The Easter Bunny paid a visit to the children and gave them an Easter gift. Granada Presbyterian Church volunteers assisted with the foot washing of guests. This event was made possible by sponsors such as New Vision Emmanuel Baptist Church, Hands that Love, UPS and Coca Cola. At the Hollywood campus, Set-Free Outreach performed a praise dance, Scott Evans Productions kept the mood fun and light with his DJ expertise. Guests received foot washing services from New Life World Ministries volunteers along with shoes and Mission Hope bags filled with hygiene supplies. Keynote speakers included Minister Gus Geldman of Calvary Chapel as well as Nathaniel Patterson of New Life World Ministries. Guests also received Easter baskets given away by AmTrust District Managers and the Hollywood Women’s Club. At the Pompano campus, guests were entertained by the musical stylings of DJ King. An inspirational dance was put together by Kadima Church inspiring the crowd on Good Friday. Those guests in attendance received foot washing services by members of Kadima Church and Kingdom Builders International Ministries. Encouraging and inspirational messages were given by Pastor Joey Foster and Pastor Marlene to out homeless guests and residents. Foot washing and care for over 600. Kids had a great time. Lots of smiles from everyone! Over 500 Fantastic Volunteers were on hand. Mission Hope bags with hygiene items.